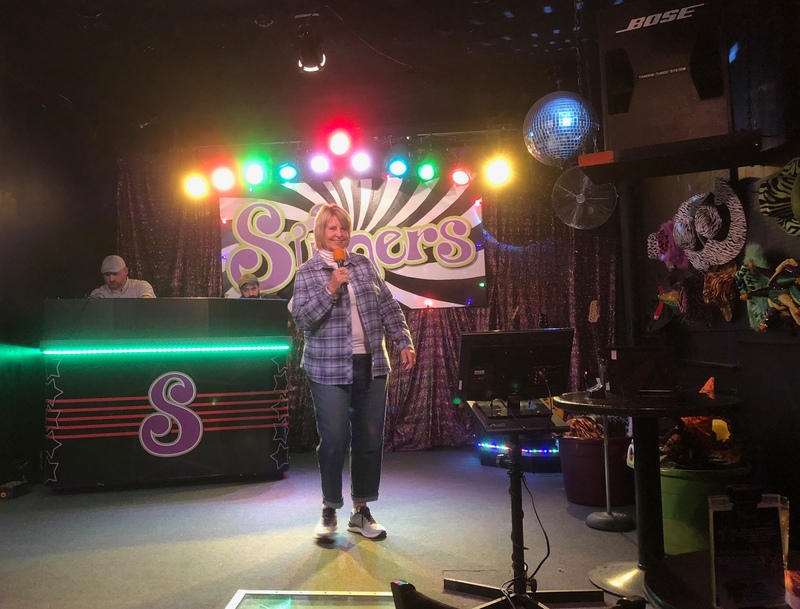 On our second trip to the Syracuse-area karaoke Mecca with our great friends Georgia, Burt and this time Chris back up from Florida, the folks at Singers opened up the big back room. And, wow, did Georgia sound and look great on that big stage. The DJ complimented her after she was first-person up with her right-on version of the classic All That Jazz, and the folks of many ages in the room applauded in a big way. Sit there for a few hours on a Friday night, and you’ll hear country and pop and classic rock and death metal from singers who represent many generations. The gracious staff and patrons, too, make all feel welcome. How fun! Sounds like my kind of place! Yes, the place is pretty welcoming for sure, Beth. What a fun place MBM!!! For the singers and the listeners, MBC.